SkyRoads was a polished-up remake of our first commercial game  Kosmonaut. The three months we spent developing this very addictive piece of entertainment was probably the best paid off time in Bluemoon's history so far: although released as small scale shareware title in 1993, we managed to sell the game all over the world, getting LCR distribution deals for it from U.S. to Taiwan. Also, the majority of Bluemoon's initial international connections were built up thanks to SkyRoads. 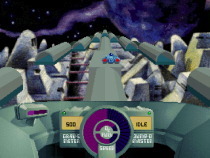 Download skyroads.zip (580 Kb, full). Download skyxmas.zip (586 Kb, full). Finally, if you are a fan of SkyRoads' music, then here's a page for you!